I was surprised to see the book uncannily doing the job suggested by its title, the moment it was delivered at my doorstep by UPS. I was thrilled to receive the book, as I , in my wildest dreams, expected my blog to get selected for a free advanced copy of this book. If that weren’t enough, I got not just one, but two copies, with the other copy, as the letter puts it, “ a giveaway to the readers of your blog”. Whoahh! With delirious excitement, I began to read the book. It was heartening to see the book beginning with Gandhi’s quote, “First they ignore you, then they laugh at you, then they fight you, then they win”. (Of late, I’ve been noticing several popular books beginning with Gandhi’s quotes,) I was quite impressed by the author’s sincerity when he rants on how it would have been if Gandhi and Edison were alive during his times. The tone reminds you of a next door ambitious entrepreneur, who is passionately sharing his life’s journey. There is a stark honesty in the voice of the author, which makes it very authentic. Despite his academic brilliance, he mentions about his achievements with a childlike playfulness. He then cheerfully explains his college days and later his first job at Oracle where he had very less of work to do. The most interesting part of the book is the third segment where he talks about the science of happiness. This part elevates the book from being a memoir of yet another achiever. He starts on a philosophical note on the basic motivation behind every action of mankind. Although we dream of doing things, the common denominator has always been a pursuit of happiness. However, most of this happiness gets tagged along to an event where happiness becomes final elusive goal tagged with a never ending list of “if “ statements. Most of us swim through these “ifs, without realizing that, as tony hseih says, “happiness lies in between”. 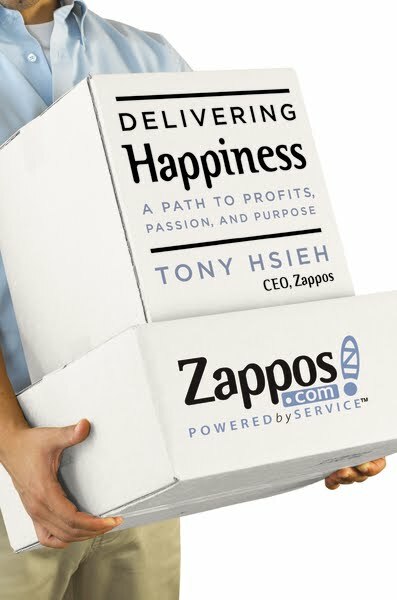 At the outset, one might wonder at how a company like Zappos, which delivers shoes online can have a vision of “Delivering happiness across the world”. However, looking at this chapter, we realize, how tony’s unflinching passion to wow his customers with splendid service, is indeed spreading happiness across the world. (He has spoken in TED India, on this topic.) As the usual clichéd line says, great happiness comes in doing small things. Zappos’ Service Reps’ call transcripts is definitely an interesting read where they handle bizarre situations tactfully!! Another aspect which I adored in the book is the way he has described the corporate culture and his efforts to spread his enthusiasm across the company. With simple culture statements like “Be humble” “Do More with Less”, it is heartening to read employees’ accounts of their experiences with those culture statements. My recent stint at Radio Mirchi helped me to witness, in close quarters, the magic of a fun-filled corporate culture. Having worked in a labyrinth styled, corporate office, it was heartening to see the way employees interacted with their bosses in Mirchi.. At Zappos, the excitement and fun seems one level higher. Through personal testimonials and blog posts, Tony Hseih conveys the essence of how his employees felt about working in Zappos. His mail informing Amazon acquisition is a brilliant case-study on corporate communications. Having read so many formal corporate statements, it was so refreshing to read it. By the time I finished the book, I was so piqued about the company that I began to look into their Careers Section to work in this company. Towards the end of the book, using the idea of Fractals, he talks about three types of happiness: Pleasure, Passion and Higher Purpose of Meaning. He beautifully juxtaposes it with business beginning from Profits, passion and higher purpose. This book portends the changing times where companies are beginning to evolve, questioning the raison d’etre of their existence! Fascinating Read. Must Read for anyone who is curious to know how the future of businesses would look like! hey, great work bro! :) :) Loved it! and hey, allow people who do not have a google account to comment as well. I mean, using wordpress accounts and all da. I'm not a business book reader, but this one is tempting.